Race Revolt started in 2007 as an intervention into the silences around race in the queer, feminist and activist communities that I inhabited. Although articles may not address activism or queer-feminist politics directly, many of the voices in the 'zine can be located within these concerns. By clicking on 'Issues' on the top menu you can read the articles printed in the 'zine and look at the artwork featured. all content will be archived here a few months after the 'zine is published and this is free to access. The paper versions of the 'zine are also in circulation. Take a look under 'get copies' to see where to buy paper copies of the 'zine, or order one direct through this site. Race Revolt is a not-for-profit project, the collecting of articles, layout, printing, website, publicity and so on are all done by myself for free. I keep the costs of the 'zine as low as possible - anymark-up from cost price is to cover the costs of distribution and ensure the 'zine can be found in various shops and distros. The project is also subsidised by donations and fundraising that help keep the 'zine affordable, contribute to the costs of running this website, and mean that paper copies can be donated to various community projects and spaces. The goal is to make the 'zine as accessible as can be. Though the 'zine does not have an editorial policy, I have started to take a more active role in editing its content. This was put in place from Issue Five and is always done in communication with authors. My input is minimal and I will never change your work without your permission. There are occasions when I will reject contributions but I will always give you a reason and am open to having pieces resubmitted. The 'zine operates with a rolling deadline, I am always open to receiving submissions and print an issue when there are enough contributions and finances to make it happen. The paper version of this 'zine is printed at Manchester Area Resource Centre on recycled paper and using soya inks. It is a good place. 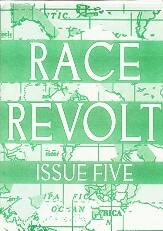 Unless otherwise stated, all Race Revolt content is published under a Creative Commons (CC) license. This is to encourage the free distribution of the ideas in this 'zine and means that contributors to Race Revolt retain copyright over their own work, and are free to republish elsewhere. Contributions may also be republished for non-commercial purposes by third parties as long as they attribute Race Revolt. To attribute the 'zine, either link back to the article's URL on this site, or cite the issue number, date and page numbers of the article. Contribute to the 'zine - I am constantly on the look out for articles, artwork, comment, letters, poetry and any other form of contribution. Race Revolt prints a wide range of pieces, so please do get in touch with any ideas. Translate articles - In the service of making the 'zine as accessible as possible I am also on the lookout for people who would be interested in translating 'zine articles for this website. If you can volunteer your skills in this then please get in touch. All translations will be fully credited. Financially support the project - If you can offer any extra pennies in the support of the Race Revolt project there's a donate button below, or get in touch about any fundraising ideas! Distribute the 'zine - If your distro or shop, library or archive would like to keep the 'zine then please get in touch. If you have any distribution ideas or are attending any events where you could help get the 'zine out there, then please email me. Link to this site - If you maintain a website or are part of a project that does and can add a link to this site then get in touch. If you have any questions on this then please email me, I aim to be as transparent as possible.